Between the message understood as a signifiant which transmits a certain signifié, and the message received as signifié, a space extremely varied and articulated opens. In it, it comes into play - from the semiotic point of view - the level in which sender and recipient share the competences related to the different levels underlying the message's significance; from the sociological point of view, in said space, variants related to mediation factors between the individual and mass communications appear (network of small groups, streaming at several levels, opinion leadership roles, habits and consumption model of the mass media, etc). 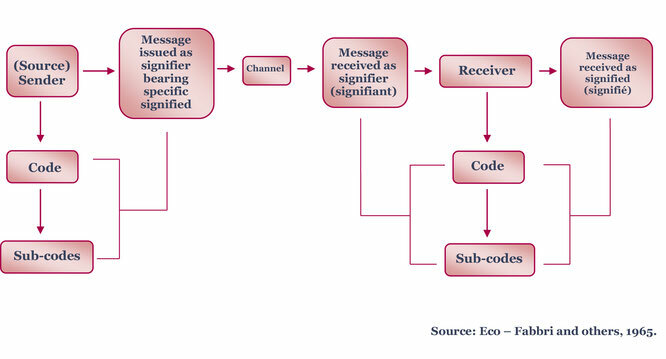 Correlations between the two orders of motives limit the possibilities of the so-called aberrant decoding: in it the receivers make an interpretation of the messages which is not in accord with the senders' intentions and with the way in which they had anticipated the decoding would happen. The epistemological value of the Semiotic Informational Model is considerable: it indicates to the mediological investigation that it is essential to englobe in the analysis' strategy the mediation of communicative mechanisms about the determination of macrosocial effects. The symbolic mediation of the media is not just the result of mechanical operations of large-scale dissemination of similar contents: it is also the result of various devices operating in the core constituted by the communicative relationship, and which give form, content and results different from that relationship. However, it should be noted that the influence of the model in the course of Communication Research has been lower than its theoretical importance: it has led to an interesting amount of studies on understanding and understandability of the messages. Authors / References: Umberto Eco, Paolo Fabbri.